108 – Frantic | All Eighties Movies. All The Time! This entry was posted in Podcasts and tagged drama, thriller. Bookmark the permalink. fantastic! love it! You 2 are my new addiction podcast! Long time listener and loving it all so much. I showed my husband this movie and he loved it. Now I’m making him listen to your podcast! He’s living that too. Stunned you podcasted this 80’s movie! 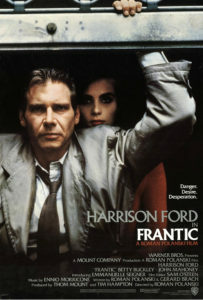 Good for you both of you as I do love this Roman Polanski movie with Harrison Ford. You both just get better and better. Such respect you do so much research. I greatly appreciate it.